An adventure holiday or activity break is a departure from the norm. If your idea of the perfect holiday is toasting yourself on the beach while the kids frolic in the Kids Club, an adventure holiday probably isn't for you. But if you have a positive attitude and want to experience new activities and visit exotic, far-flung destinations, then this is your chance. Why Choose an Adventure Holiday? Despite general opinions to the contrary, you don't have to be a thrill-seeker to participate in an adventure holiday. Adventure holidays offer activities that range from simple British walking tours to bungee-jumping and kayaking to exploring nature in the Australian outback in a tent. The choice is up to you. If your family prefers not to be part of a group, there's also no need to worry. Adventure holidays can be tailor-made for just you and your children, or you can take part in a group adventure. Why don't you invite another family that you know along, and make a party of it! 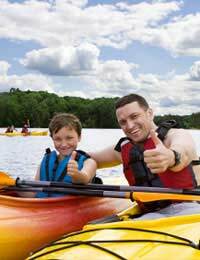 Whether you like to swim, kayak, scuba dive or try your hand at white-water rafting, watersports holidays offer something for most age levels and abilities. From simple nature walks to cycling or trekking, these types of hols are great for children who like nothing better than playing outdoors. Walking holidays can be as strenuous or as serene as your family can withstand. Either plan an itinerary on your own, or sign up with a company. Many offer sherpa-style service, meaning they daily transport your luggage to your next overnight destination. Most kids love being on bikes, and these holidays combine daily cycle rides. Choose a country, then decide on the other activities your family would want, such as white-water rafting in Poland, visiting a thermal spa in Austria or simply enjoying the British countryside. Travel to exotic lands to spot animals in remote areas. You can look for orang-utans in Malaysia, trek the big cats on a Zanzibar safari, or look for exotic frogs, insect and butterflies in Costa Rica. Fancy climbing the world's tallest sand dunes in Namibia, going on an elephant ride in Nepal or camping in an Indian jungle? Many tour operators offer family adventure holidays that concentrate on a specific country, with activities tailor-made to each area. Check the minimum required age before booking any adventure holiday. Even if there is no age-limit per se, many of the activities may require children to be of a certain age to participate. It's no use taking a five-year-old along if they won't be able to take part in many events. If you book a tailormade adventure holiday, be aware that some companies can book families with children of different ages together. That makes a lot of sense if you have very young children or teenagers! Ask before you go to ensure you and your teens won't be spending the entire holiday with groups of seven-year-olds. Be aware of any insurance needs that you may have to meet before your departure – not only if someone in your family requires hospital care abroad, but also if they need to be transported back to the UK. Read the fine print carefully - you may need to pay extra for watersports, for example - and go over every detail of the contract in advance. If inoculations are required, remember that you may need to get them in advance to ensure they are fully effective. Make sure you bring the right kit that's suitable for your holiday, and find out beforehand what gear you may need. It may be difficult to purchase the right equipment at your destination. Also, be aware of any climate-related hazards that will require extra protection, such as mosquito netting, suncream etc. Finally, make sure you book with a legitimate organisation that has a good reputation – and safety record. If you are going somewhere remote, you may also want to check their credentials as an environmentally and eco-friendly outfit. Some companies specialise in eco-tourism, if you want to go completely green. Adventure holidays are not for the faint-hearted, but they offer a nice break from the usual sun-and-sand family holiday. While there are greater insurance and safety issues involved, they can be tremendous fun, especially if you have teenagers who get easily bored. Do your homework and find something that suits everyone in your family. Make this summer's holiday be one that both you and your children will remember for years to come!